What I love: I love my end tables, what I don't love is the drink rings that end up all over them from my kids and drinks. The Feed the Need Premium Silicone Coasters are every mom's prayers answered. This set is packaged in a wonderful cardboard box that would be perfect if you were giving these as a gift. They come with a nice black holder for collecting them all when they are not in use. It comes with 6 coasters in a rainbow of bright beautiful colors, red, orange, yellow, green, blue, and purple. This makes them fun and easy to find or know which one is missing. They are also great for your family or parties to assign each person a color so you can always keep track of whose drink is whose. Both the holder and the coasters are made of eco-friendly silicone making them almost indestructible. Ceramic and paper coasters often form sweat and condensation under the coasters, they break and they tear apart. With these you do not have that worry at all. 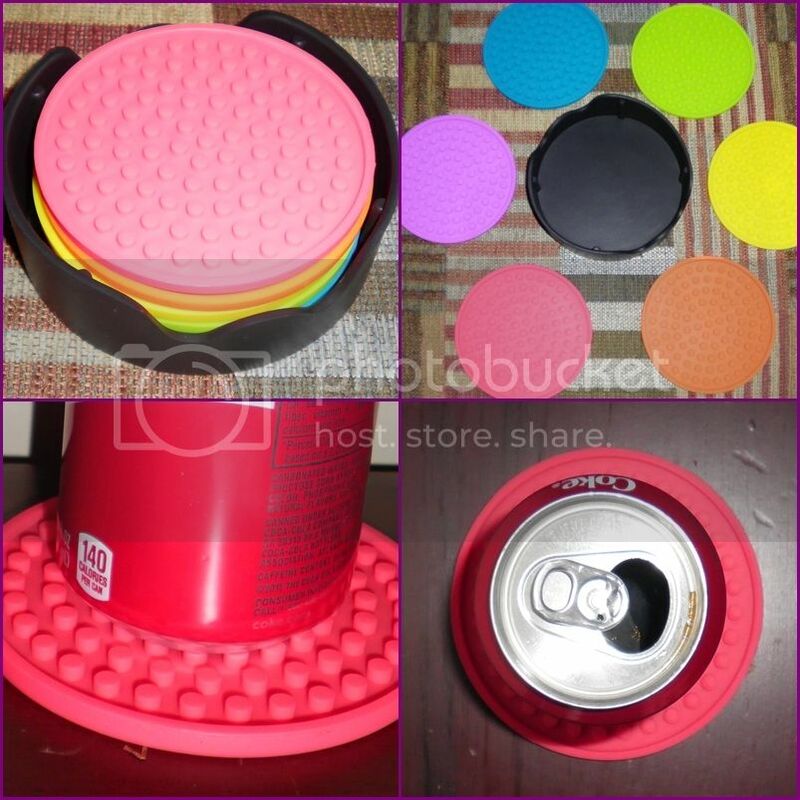 They have a texture to the top so that condensation and water can pool on the coaster, not your tables. I really love the width of them, each coaster is extra large, 4.5", way larger then the other coasters I have, making it more likely to suite all our cups, even my largest coffee mugs without drip off onto the table. The best part of these coasters is when you are done using them for the day you can throw them right in the dishwasher to start fresh and clean the next day!!! I have washed mine a few times so far and there has been no warping, bending, fading of color or any issues whatsoever. I love these coasters! I also like that buying these is helping the needy. A portion of the profits from each Feed The Need product is donated to fight hunger throughout the world.